The Bonemeal Bag is an item added by the Natura Mod. It is used for more efficient storage and use of Bone Meal. 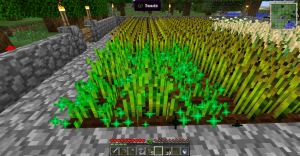 In addition to simply storing groups of 9 bone meal in one item, right clicking in the center of a 3x3 area of not fully grown crops with the Bonemeal Bag will apply the effect of a single bone meal to all of them, making it much easier to apply bone meal to an entire field. Bonemeal bag being applied to a 3x3 grid of seeds. Fertilizer (MineFactory Reloaded) - A machine from MineFactory Reloaded that automatically boosts the growths of crops with special fertilizer.